Not too long ago, I wrote an article Your Angular app as Progressive Web App where I explained why Progressive Web Apps are the future of web applications. In that article I also briefly touched the Angular SwPush and SwUpdate APIs, where I also mentioned I might write an additional article to go deeper into that subject. A promise is a promise, so here it is! I’ll go a bit deeper into the possibilities these two APIs have to offer and show some examples. SwPush and SwUpdate are both conveniently exposed in the same package @angular/service-worker, which we’re obviously going to use. Resulting in this output which we will use later. However: do not use these keys and generate your own! 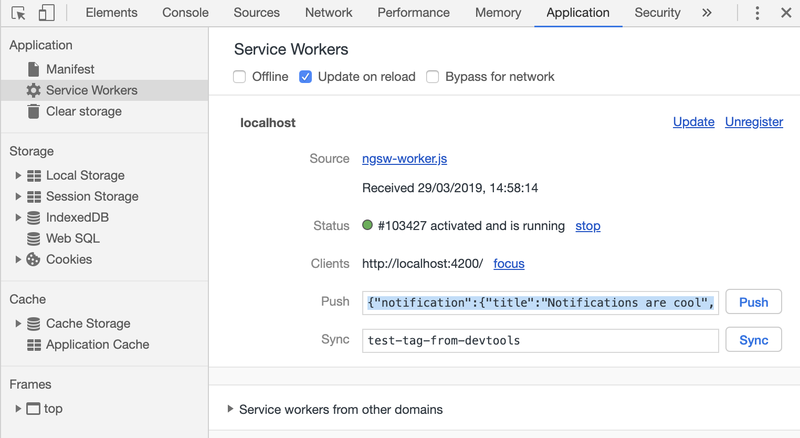 Not too long ago Angular started supporting push notifications through SwPush, which allowed developers to listen and subscribe to, push notification from the service worker. However, it was lacking the possibility to interact with these notifications. So users were able to receive notifications, but clicking on it simply didn’t do anything. This fortunately changed around Angular version 7.1 where we can now add actions to our notifications. 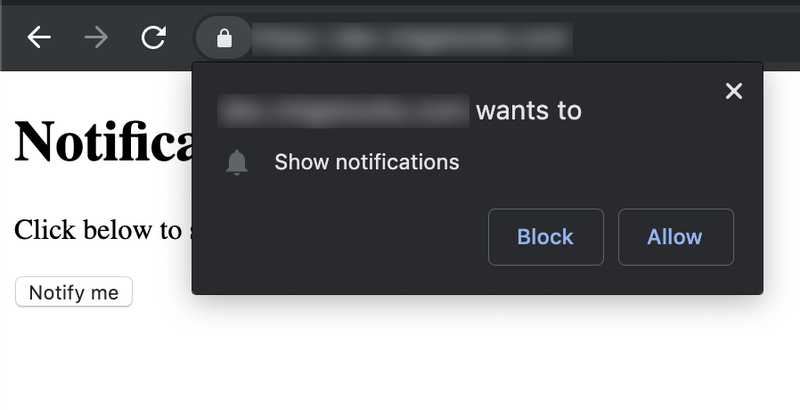 Before we are able to send notifications, users have to opt-in to your website’s notifications. We can request this by using the SwPush’s requestSubscription. 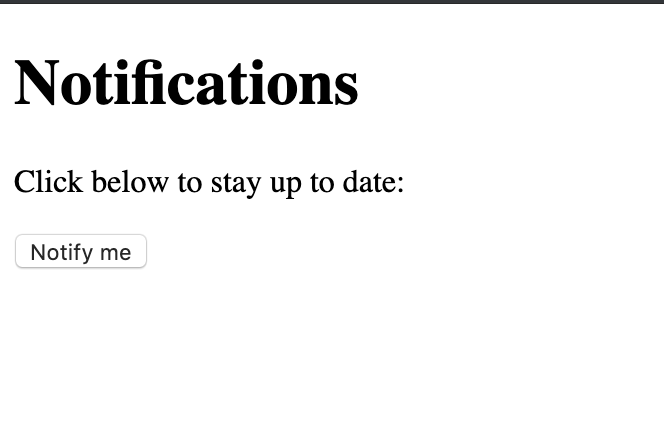 To demonstrate this we’re going to create a component NotificationComponent that shows a button. When a user clicks it, we’re going to try to subscribe that user to show notifications. This component will use our own service WebNotificationService to actually submit the subscription to our server. The component we’re going to use has a single interaction element: a button, which when clicked will create a subscription and send this to our backend. This button is where our users will start the web-push journey. As you probably noticed, we also have two <p> elements. 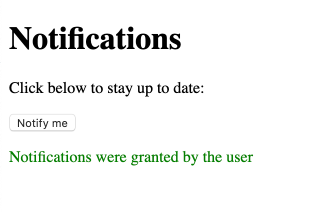 The first one informs the user that he has granted our website permission to send notifications. This check is done by looking at the browser native object Notification and checks what the given permission is. The second <p> element tells the user that their browser either (1) does not support service workers, or (2) the service worker is not enabled in the application. When the user has interacted with our button, we will send the subscription to the server. This logic has been delegated to our WebNotificationService, so let’s have a peek at that. This is also where our previously discussed VAPID public key comes in! First we have the endpoint which our backend should call when sending a push message, followed by the p256dh and auth keys needed to prove that the user has given permission to receive these messages and we are who we say we are! Now that this has been taken care of, and the user has given us his blessing to receive our notifications, we’re going to send a push message. But as I mentioned earlier in the article, we will mainly focus on the frontend part of things, so how will we test this without a backend? Chrome has already found a solution. In our Development Tools “Application” tab we can inspect the service worker and test from there. This time when we click the notification, a page will be opened to our url defined in the push payload. Great that everything seems to work in our little browser vacuum, but we need a real world solution. Let’s connect this to a simple backend! We’re going to create a server.js file and write our NodeJS server. In my previous article about Progressive Web Apps, I explain why we need to build our frontend and then serve it with http-server. We’re going to do this now as well, and start our freshly created server (code is slightly more below or on Github). Every time this server receives a new subscription, it will immediately send out a push notification. In my article about PWAs I’ve made a small repo on Github showing a basic PWA. I’ve created a separate branch and pull request to make it easier for everyone to see the changed involved. What’s going on here? We have a button that, when clicked, will tell the service worker to check for a new version in the checkForUpdate function. In the constructor we see that we’re subscribing to the swUpdate.available observable. This observable emits when there’s a new update available. When it does, it will invoke updateTolatest which will reload the document. This is not really an elegant solution though. When a user is on your website, it will reload the page by itself and any input will be lost. Also, users shouldn’t have to check for updates themselves. This pull request will show you the changes we’ve made above. But let’s find a better way to let users always have the best experience. On the SwUpdate Angular page we can find a service that will check for an update every 6 hours. Let’s use this service! // Allow the app to stabilize first, before starting polling for updates with `interval()`. Our toaster notifying the user that there’s an update. If you want to see the full example, you can check out this Github pull request. In this article we have gone over the functionality of SwPush and SwUpdate. These two packages can be leveraged to make our PWA more interactive, and to make sure our users are aware of updates. Our users will always have the most recent and optimal experience on our web applications. We have come a long way when it comes to websites and web applications. 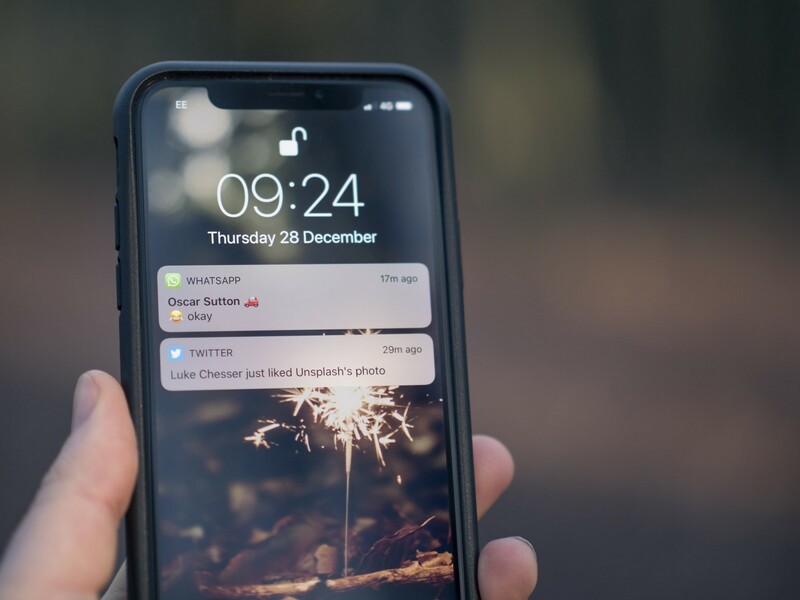 Progressive Web Apps are the next step on this beautiful journey. Not only are we able to quickly, and conveniently, show our web application on our users’ devices, but we’re gaining more and more tools to make our applications more interactive, intuitive and useful. Being able to present our users with information whenever they need it, is nothing short of a little miracle! Looking for a job in Amsterdam? I work for Sytac as a Senior Front-end developer and we are looking for medior/senior developers that specialise in Angular, React, Java or Scala. Sytac is a very ambitious consultancy company in the Netherlands that works for a lot of renowned companies in banking, airline, government and retail sectors. You can think of companies like ING, KLM, Deloitte, Ahold Delhaize, ABN AMRO, Flora holland and many more. From a personal opinion Sytac really sets itself apart with their client portfolio, but also with how they take care of their employees. They do really care about the wellbeing of their employees. Apart from a good salary (50K-75k), you will notice this in regular meetings with the consultant managers but also by the amount of events they organise and all the other perks they offer to keep all employees happy. If you think you have what it takes to work with the best, send me an email on arjen.brandenburgh@sytac.io and I’ll be happy to tell you more.